Joseph Hubertus Pilates (pronounced Puh-lah-tes: of Greek origin), was born in 1880, near Dusseldorf, Germany. As a child, he suffered from such ailments as: asthma, rickets and rheumatic fever. Determined to overcome these, he began studying any type of exercise method he could find, including: yoga, Zen and ancient Greek and Roman exercise regimens. It is said he worked so hard at strengthening his health and physique, that by the age of fourteen, he was asked to pose for anatomical charts. He also pursued sports, becoming a diver, skier and gymnast. In 1912, he went to England to become a boxer, and worked as a circus performer. While there, World War I broke out, and he was interned in a camp for German nationals. During his internment, he taught his method to others in the camp. None of his followers succumbed to influenza or any of the other devastating diseases prevalent at the time. He also worked with injured people in the camp, creating equipment using springs from hospital beds, to provide spring resistance for rehabilitation. These machines became the prototypes for the machines he later invented, which are still in use today. After the war, he returned to Germany and trained the Hamburg city police. His teaching came to the attention of the German government, and he was asked to train the New German Army. At that point, he decided to leave Germany for America, and emigrated to New York in 1926. He and his wife Clara, a nurse, opened a studio there, bringing his revolutionary method of physical and mental conditioning to the United States. In New York, his work was noticed by the dance world, and his technique became incorporated into dance training. Dance luminaries, such as Ruth St. Denis, Ted Shawn, Martha Graham, George Balanchine, Hanya Holm and Jerome Robbins all studied Pilates’ method, and taught the regimen to their students. In addition, he worked with actors, singers, lay people and helped people from all walks of life attain health and fitness. 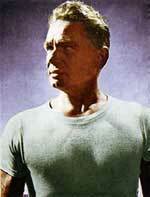 Joseph Pilates died in 1967, at the age of 87. It is believed he died in or from injuries sustained from a fire in his studio. Considered a forerunner of physical therapists, he believed his work was fifty years ahead of its time. Though he originally named his method “Contrology,” after his death, it became known as the Pilates Method. Joseph Pilates’ definition of physical fitness was: “The attainment and maintenance of a uniformly developed body with a sound mind fully capable of naturally, easily and satisfactorily performing our many and varied daily tasks with spontaneous zest and pleasure.” This statement is as relevant today as when he wrote it in 1945.